Velcro receptive sponge abrasives have abrasive grit on 1 side of a foam base and are used with power tools. The loop material backing of the product attaches to the hook material on a sanding machine. We manufacture two styles of product with loop material backing, sanding pads and sanding discs. 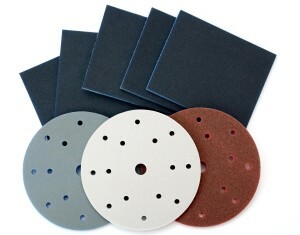 Sanding discs are available with or without dust extraction holes. The holes can be to our standard pattern or a custom design. The foam we use for manufacture can be either closed or open cell. Closed cell foam is available in several colours. Products can be coated in wide range of abrasive grit types including White Aluminium Oxide, Black Silicon Carbide and Green Silicon Carbide. The choice of grit type and grade determines how aggressive the sanding process will be. Discs and pads are offered in a grit grade range of 60 to 320. To maintain performance these items are washable and can be used wet or dry. Both sanding pads and discs can be printed on the backing side using our screen printer. We offer standard print or can create a print of your own brand marking. Sanding pads can be shipped in plain bulk packaging for economic transportation, or we can arrange display boxes, sleeves or shrink wrapping if you have a specific packaging requirement. Abrasive pads and discs with loop material backing for use with sanding power tools.